Orla is Artistic Director of the Traverse Theatre. 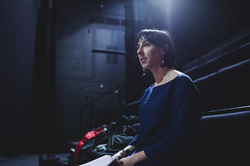 Prior to taking up post at the Traverse, she was Artistic Director of the award-winning Pentabus Theatre and International Associate at the Royal Court Theatre. Directing work for the Traverse includes Ciara, Clean, A Respectable Widow Takes to Vulgarity,The Arthur Conan Doyle Appreciation Society, The Artist Man and the Mother Woman, and the Herald Angel award winning Dream Plays (Scenes from a play I’ll Never Write). Other directing work includes: For Once (Hampstead Theatre Studio, National Tour); Kebab (Dublin International Festival/ Royal Court Theatre); How Much is your Iron? (Young Vic); The Hound of the Baskervilles (West Yorkshire Playhouse/ National Tour/ West End); Tales of the Country, Origins(Pleasance/ Theatre Severn); Relatively Speaking, Blithe Spirit, Black Comedy (Watermill Theatre); Small Talk: Big Picture (BBC World Service/ ICA/ Royal Court Theatre); A Dulditch Angel (National Tour) and The Fire Raisers, sob stories, Refrain (BAC). Orla has also directed two large-scale, site-specific productions: Shuffle with the National Youth Theatre at Merry Hill, one of Europe's largest shopping centres and Underland, performed 200 feet below ground at Clearwell Caves in the Forest of Dean. Orla was winner of the James Menzies Kitchin Directors Award and recipient of the Carlton Bursary at the Donmar Warehouse. Linda Crooks has worked as a theatre producer for over twenty five years. She has led a number of highly successful theatre and festival enterprises during this time including her starting up her own business at the age of 25. Based in Edinburgh, “The Festival City”, she has considerable experience in festival and event management, in leading organisational change, programming, producing, fundraising, policy development, touring internationally and the commissioning and presentation of new work. She has a keen interest in “telling the right story, to the right people, in the right way” in order to create opportunity to reach new audiences and unleash fresh talent and passion - across a wide range of theatre skills. She is extremely proud to be Co-Chief Executive of the Traverse alongside Artistic Director, Orla O’Loughlin and Executive Producer of the internationally renowned theatre since January 2012. The Traverse is Scotland’s premier new writing and producing theatre, hosting an annual curated theatre Festival in August and a year round theatre and event programme with Festival partners such as Imaginate, (Scottish International Children’s Festival), Manipulate (Festival of Puppetry and Animation), Edinburgh International Film Festival and a Festival of Dance each Autumn with Dancebase. The richness of the Traverse story is impossible to tell in a few words but 50 Years of New is our attempt.